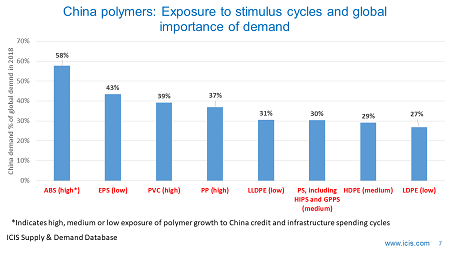 CHINA’S apparent demand for polypropylene (PP) grew by 4.7% in 2018 over the previous year as the impact of the fall in auto and other durable goods sales hit the market hard, is my preliminary estimate. This would represent the lowest annual growth since 2012. Apparent demand, which is net imports plus local production, isn’t what we call real demand. Real demand is apparent demand adjusted for inventory distortions. 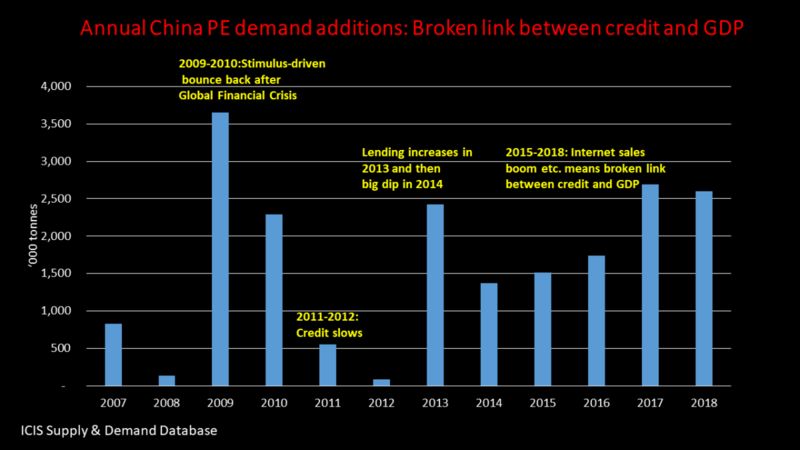 But there was an average of less than a percentage point difference between the ICIS assessments of China apparent versus real demand growth in 2000-2017. If we therefore assume that 2018 real demand is also assessed at 4.7% this would compare with our earlier forecast of real consumption growth of 6.5%. 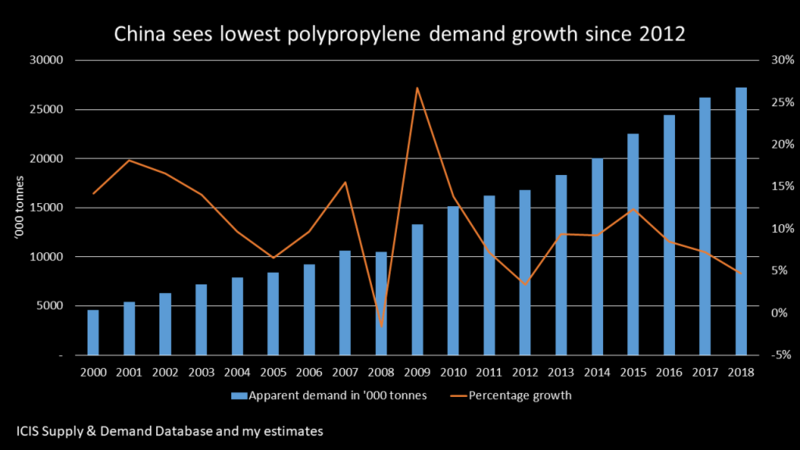 Real demand would end up being at 27.2m tonnes – 341,000 tonnes lower than we had forecast. Don’t say I didn’t warn you. 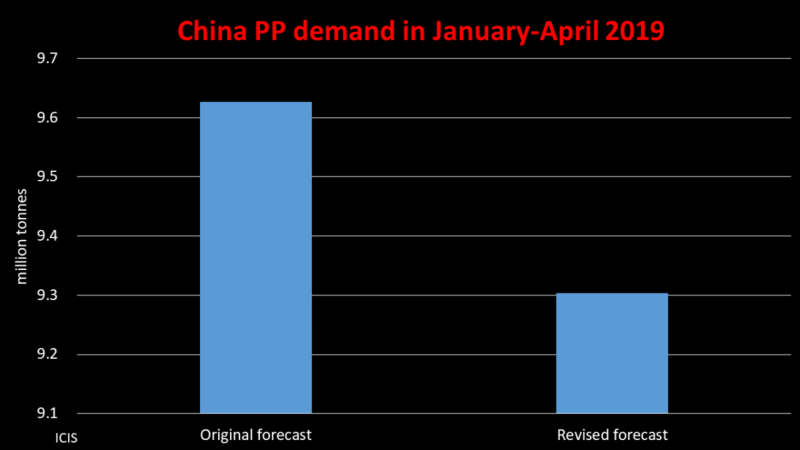 In my 4 January post I predicted disappointing China 2018 PP demand growth because of the fall in auto and other durable goods sales such as washing machines. Auto sales contracted by 6% in 2018, which was the first annual fall since 1992. We now need to consider what’s going to happen next. In the three weeks before Tuesday 29 January, the share prices of China’s auto makers had rallied by around 20% on the belief that the government was about to launch major stimulus measures that would boost auto sales. But when the measures were announced, the car manufacturers’ shares slipped by 4%.The reason for the disappointment was what the Wall Street Journal characterised as the conspicuous vagueness of the stimulus measures. Local authorities “with adequate resources” were told to offer subsidies to rural car buyers – in other words, not the many provincial governments carrying heavy debt burdens. There was no mention of a repeat of the tax cuts that boosted car sales in 2015-2017. This is because the tax cuts brought forward demand, meaning that a repeat of the exercise would have limited effect. “Both substandard and high quality vehicles were sold to consumers, but currently resources will be allocated to high quality companies,” said Miao Wei, minister of industry and information technology, when the stimulus measures were announced. It thus seems likely that the government would not be too unhappy if auto sales growth remained depressed in 2018 if this helped to achieve a restructuring of the oversupplied local car industry. 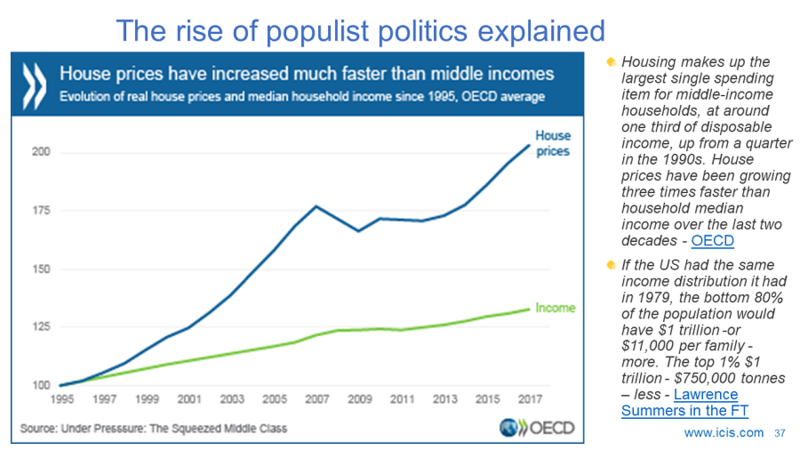 Such a restructuring would also be in line with producing higher quality vehicles as China tries to escape its middle income trap. The government might change its mind and launch a bigger effort to boost auto sales. But, as is said, this probably wouldn’t work given that the 2015-2017 tax cuts has brought forward demand. And can consumer confidence be turned around given the scale of the cutbacks in shadow lending and the possibility that the trade war will rumble on? Probably not. Failure to reverse the decline in confidence would be negative for retail sales in general. 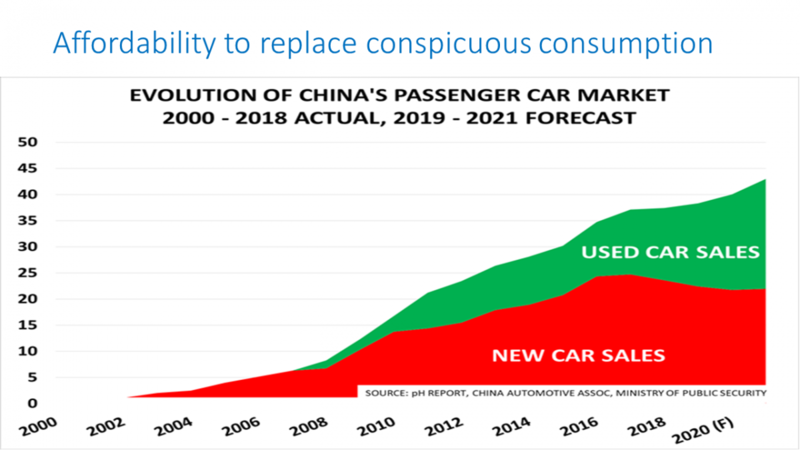 A return to even modest auto sales growth in 2019 would still deliver many millions more sales of cars and trucks because of the huge size of China’s market. 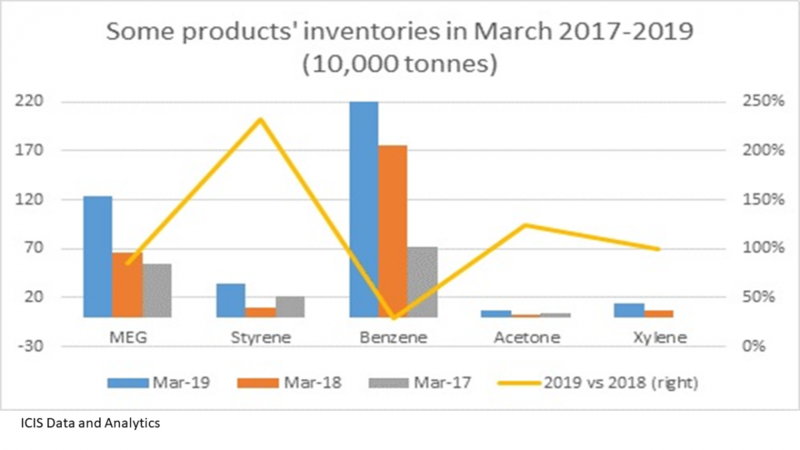 This would in turn lead to a big uptick not only in PP demand, but also in all the other chemicals and polymers used to make autos such as styrene butadiene (SBR) and rubber and acrylonitrile butadiene styrene (ABS). SBR and ABS also saw disappointing growth in 2018. 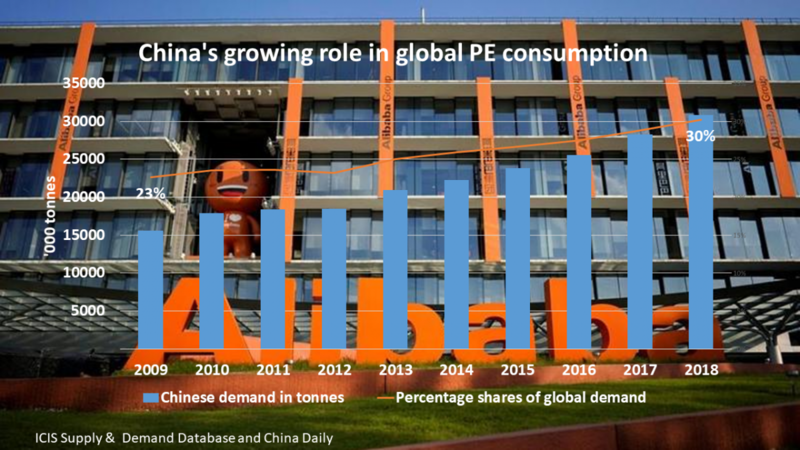 But even the slightest of interruptions in the “China economic miracle” is very bad news for the global chemicals industry because of its huge dependence on China. 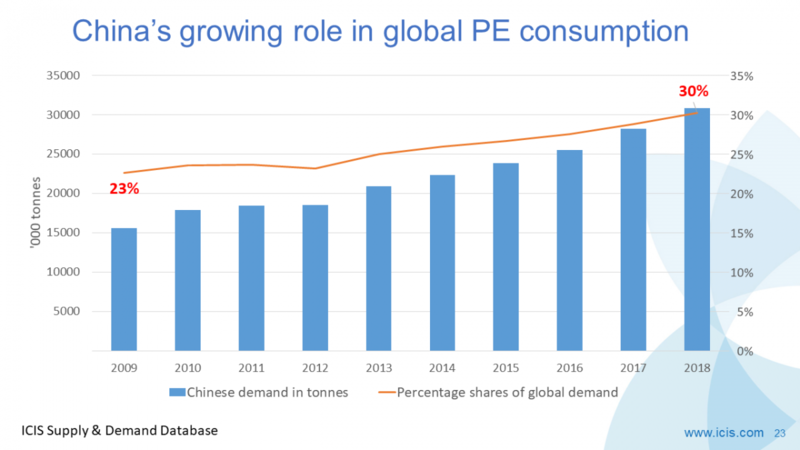 In the case of PP, we estimate that 37% of global PP consumption will come from China in 2018-2020, making it by far the biggest source of global growth. Europe would be in distant second place at 17%.